In the Achanakmar Tiger reserve, out of 25 villages in the core area of the tiger reserve, 6 forest Villages-Jalda, Kuba, Bokrakachhar, Bahud, Bakal, and Sambhar Dhasan, with around 249 families were relocated from the tiger reserve during December 2009. The main inhabitants of these villages were Baiga (a tribal group) followed by Gond and Yadavs communities. 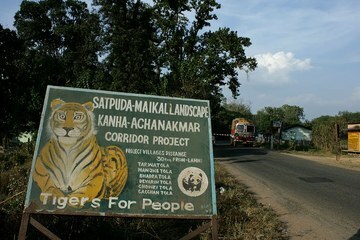 In February 2009, the tiger reserve was notified under Project Tiger, with the condition of relocating all the villages from the core area of the reserve to make "inviolate space" for tigers. Villagers were promised a fixed compensation package of 1 million and basic amenities in the new settlement place like-5 acres of agriculture land/household, accommodation, school, healthcare and better livelihood opportunities. But when this relocation was done, the alternative location was not made ready for the displaced population and each household was given a petty amount of Rs.5000 cash and Rs.45,000 in the bank account, which was spent mostly in meeting the daily needs and housing arrangement. The relocated families who are living at the edge of the forest have been strictly prohibited of collecting forest produce and fuelwood from the forests. The Baiga tribal argues that they have no alternative livelihood options outside forests and are working as contract labour at construction sites in urban areas. This relocation was done without considering the option of co-existence which is a violation under the section-4(2)(c) of the FRA,2006. Baigas who are primarily dependent on forest for livelihood have run out of livelihood opportunities in the area where they have been relocated. The land is of poor quality and away from the forest resources inhibiting them from practicing their livelihood activities. Project Details Achanakmar wildlife sanctuary (AWLS) which spreads over an area of 551.552 square kms was declared as a critical tiger habitat and included under Project Tiger in 2009. AWLS is also the habitat of Baiga tribe, one of the most primitive tribal groups who have lived in this region for centuries. As per the revised guidelines of the Project Tiger announced by the National Tiger Conservation Authority, forest departments of state governments have to decide inviolate spaces and relocate villages from crucial tiger habitats within a time frame by providing a better relocation package. The forest departments are also required to settle the forest rights of communities living these villages. But in Achanakmar Tiger Reserve the Chhattisgarh forest department violated these guidelines. It has not given them better relocation packages and is not settling the forest rights of the Baiga tribals, which is their right under the Forest Rights Act of 2006. Development of Alternatives -An independent review of the status at rehabilitation sites including livelihood, living accommodation, access to forests, access to education, health services and other civic amenities must be conducted. Based on the outcomes necessary steps should be taken and only then should the next phase of rehabilitation be taken up. · All forest and land rights claims filed under the Forest Rights Act of 2006 should be first settled – specifically community rights. -The Forest Rights Act of 2006 provision of right to protect the forests should be acknowledged and this should be taken into account before any further displacement takes place. ·-Forest Rights Act of 2006 and the Revised guidelines for the ongoing centrally sponsored scheme of Project Tiger, 2008, mention about the right of the adivasis (tribal groups) and other forest dwellers to access natural and forest resources and this should be upheld. · The form of displaced is forced (by manipulation). The forest department needs to show cultural sensitivity, especially while building the homes which should be such that they are specific to the cultural and social context of the communities. Further, resettlement sites should be identified such that they are near the forests so that people can access the natural and forest resources. -Money that is due to the people who have been displaced should be given, and bank passbooks should handed over to the heads of the households. -Any tourism development that takes place should take the community into confidence and the process should ensure that the opinions of the community be respected and acted upon. Why? Explain briefly. Department of Forest still does not acknowledge the socio-economic and cultural fault in the relocation plan of the Baiga tribal and has not yet settled Forest rights of the communities living in other villages in the core area of the reserve. However the relocation plan for other 5 villages have been prepared and proposal has been approved by the Forest Advisory committee of the Ministry of Environment ,Forest& Climate Change who has advised the State to settle forest rights before the process for relocation. Violation under Section-3(1) and Section-4(2) where community rights settlements is compulsory before relocation of the tribal and forest dwellers from the forest area. The article is about the unpreparedness of the State Forest Department in relocating the Baiga tribe from the core are of the forest to fringe location, about the cultural injustice done by the department for protecting the forest from the saviors and survivors of the forest.